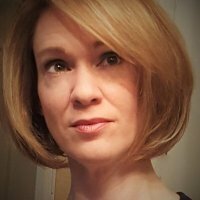 Debbie Briggs has more than 20 years of experience writing and editing for newspapers, magazines, and now for B2B and B2C companies online as a brand content strategist for Pole Position Marketing in Uniontown, Ohio. A contributing writer for Shop Owner since 2010, she previously served as a contributing editor for TechGroup publications, including ImportCar, Underhood Service and TechShop. She has a Bachelor of Arts degree in Journalism and Mass Communication from Kent State University. Connect with Debbie on LinkedIn for the opportunity to have your shop featured in an upcoming issue of Shop Owner. 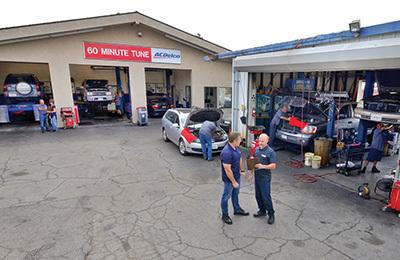 When customers visit 60 Minute Tune, an Auto Value Certified Service Center and a customer of Warren Distributing located in Granada Hills, CA, they’re greeted by the smell of fresh coffee and friendly, smiling faces. Shop owner David Jackson wouldn’t have it any other way. If it sounds inviting, that’s because it is. Jackson says he subscribes to the Golden Rule and has done so since he bought the shop after working there for only nine months. He’s doing something right, as the shop originally opened in 1988 is still going strong. “Our customers are our friends,” he explains. “Their children know which drawer to open to find the candy. And when you look on our wall, you’ll see a collage of pictures of our customers as well as their pets. 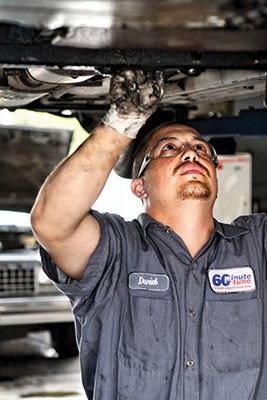 While 36 percent of the vehicles serviced and repaired at 60 Minute Tune are Toyota and Lexus models, Jackson says his four full-time techs work on a variety of other makes, including Ford, GM, Chrysler, Honda, Nissan and European models. 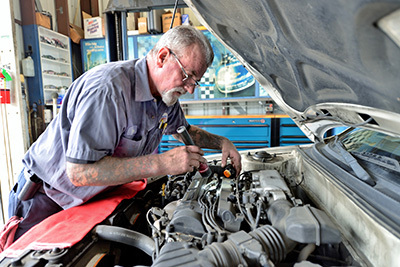 To stay current on the full spectrum of maintenance, diagnostic service and repairs they perform, Jackson says they take advantage of different avenues for training. 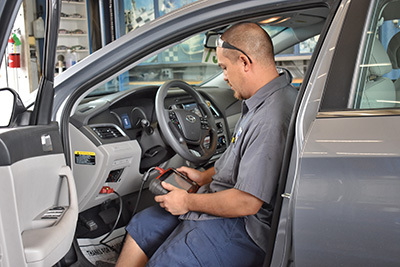 While the shop has had very little turnover, Jackson said when they are in need of a new technician or service writer, they usually turn to people they know. The 60 Minute Tune team (from left): Tony, Richard, David, Gus, Trini, Vince, Daniel and Joe. 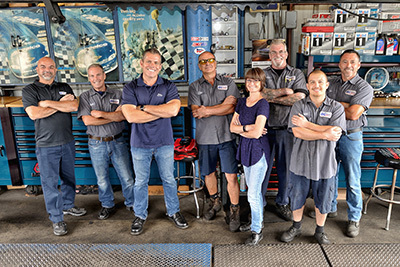 Having seasoned employees helps the shop maintain a high level of productivity, as well as high levels of customer satisfaction when vehicles are repaired on time and correctly the first time. As a sitting member of the Auto Value/Bumper to Bumper Service Center Advisory Council, Jackson also helps guide the Aftermarket Auto Parts Alliance with its shop-focused programs. 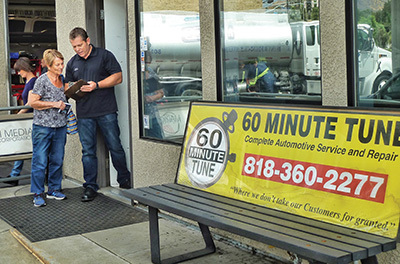 60 Minute Tune is also affiliated with the Automotive Service Councils of California (ASCCA), Auto Value/Bumper to Bumper’s Confidence Plus Warranty program and ACDelco’s Professional Service Center program. Jackson says these connections have proven to be invaluable over the years. 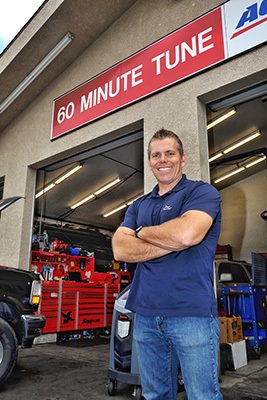 When potential customers visit 60MinuteTune.com, they’re greeted by the same smiling faces they’ll see when they bring their vehicle into the shop. Connecting with customers via the Web, Jackson says, is absolutely essential for getting customers into your shop. “A website that is mobile-friendly is a must,” Jackson explains. “Building systems that are interactive with your customers is also important, such as the ability to request service appointments and a map to get directions to the shop.